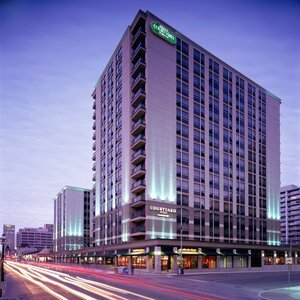 Experience the largest full-service Courtyard by Marriott in the world, Courtyard Toronto Downtown. Our renowned Toronto hotel is near shopping in Bloor-Yorkville, Toronto Eaton Centre, entertainment, businesses and subway transit. Unique among Toronto hotels downtown, our newly redesigned lobby provides the flexibility to work and socialize however you choose. Guests appreciate high-speed 100 Mbps wireless Internet that is complementary in guest rooms and public spaces and the fastest compared to other hotels downtown. GoBoardÂ® technology offers touch-screen capabilities with news, local information and restaurants, so you can map out your stay. The restaurant and lobby Bistro offer healthy food and beverage options, proudly serving StarbucksÂ® coffees as well as cocktails and wine. Our unique hotel in downtown Toronto features 575 spacious guest rooms, a 24-hour fitness center, indoor lap pool, valet parking, tour desk and concierge, as well as function space for 400 people.